Up for Hiking and your bottle gets empty, what would you do if you were in this situation? Probably you would have searched for a water source. But pretty sure, no one will approve to drink water that is full of bacteria and microbes. So we have two options, either to drink that contaminated water or die of thrust. This product is designed for situations where you don’t have a water source providing you clean drinking water. 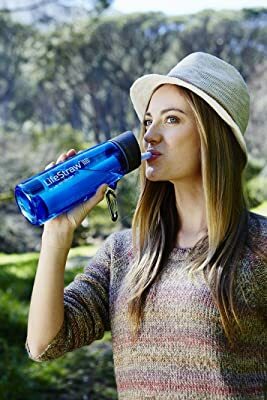 It is a water bottle with life straw filter attached to it and is surely going to help you since you can’t carry a water filter everywhere. Isn’t it a great idea that you can carry a water filter everywhere you go ? This LifeStraw product has been specially designed to help you with this. A light weighted bottle weighing mot more than 3.8 ounces is no less than a wonder. Compact sized with dimensions 3×3×9 inches it can easily be carried everywhere you go. Designed with sport style of golf, it has a elegant and smart look, that means it comes with quality as well as good looks. It is available in black and blue colour. A thing to show of definitely! This leak proof bottle is highly efficient in its working and has been surpassed by EPA standards to provide you with water free from popular and harmful contaminants like E. Coli, Giardia, cryptosporidium and many others too. For filtering the water has to go down approximately to 0.2 microns without usage of chemicals. That means, chemical free filtration. For there are many other water filtering bottles two, one more factor that puts it above them is that it can filter water up to 1000 litres. A big count, no? It is build with BPA-FREE tritan, which means that it is highly durable. What else a buyer will ask for other than durability and high quality? The mouthpiece attached to the bottle is qualities food grade also having flexibility. This feature ensures that it doesn’t get cracked or chipped. Also, you can easily remove this mouthpiece for cleaning purposes and then easily fit in again too. The water filter, soul part of the product is easily detachable so that you can easily replace it by another LifeStraw filter when the former reaches its capacity. It gives you clean and fresh drinking water. 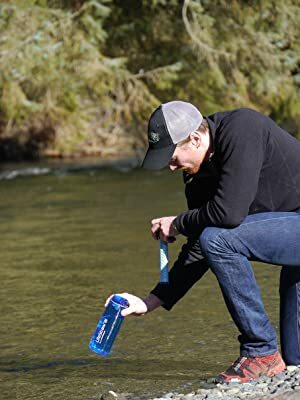 No matter if you are in a hiking activity or camping or travelling , you can easily take it with you and supply yourself with contamination free drinking water. It can easily be reused from time to time which will definitely lower down the value of pollution caused by waste plastic water bottles. It can easily be carried with you due to its convenient and compact size. For easy convenience, you can use it along with a carabiner so that you can easily attach it with your backpack. Or you can also put it in your kit for safety. It is specially made up for emergency and provides you with an object functioning like a handy water filter. It’s water filtering unit that can be easily replaced makes it more durable then it already was. It is made up of high quality plastic thus you don’t need to worry about its breakage. It’s mouthpiece can easily be detached and cleaned which makes it more featured. It looks elegant, has a sleek design and can be added in perfectionist list. In the very beginning it gives plastic after taste that isn’t preferred. Though it fade away quickly. It’s base will crack down if the bottle falls almost perpendicular to the surface. It is a bit expensive when compared to its water capacity. This LifeStraw product has been rated 4.3 stars out of 5 by its verified buyers. Also, it comes with 65 percent of customers that rated this product 5 on 5. It is mainly a Vestergaard product, a company that is specialised to make products to control diseases.It uses modern hollow sized fiber membrane technology for water filtration that is perfect. Click here for more details.